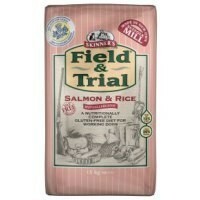 Skinners Field and Trial Salmon & Rice Dog Food is a gluten-free, completely hypoallergenic food developed for working dogs. It is formulated to give an excellent balance of Omega 3:6 fatty acids, which can help support your dog's immune system. As a valuable source of energy and to maintain a healthy coat condition, it is also coated in natural sunflower oil. Skinners Salmon & Rice also contains enhanced levels of Glucosamine and Chondroitin to help protect the joints of your dog. Whole rice (40%), salmon meal (17.50% dry weight), naked oats, peas, sunflower oil, whole linseed, sugar beet pulp, vitamins and minerals. Ref(Order #1893616) Just re-ordered this food,Our dog absolutely loves it, so never any waste. Great balanced diet and can be varied by adding liquids and/or veggies.Great price too. Our dog loves this, so no waste. Keeps his coat beautiful, have tried quite a few brands but this one seems to be the most acceptable. Good mid price range too. Great food - my Greyhound loves it and is doing really well on it, a happy tummy and shiny coat. Previously used James Wellbeloved Fish & Rice but that seemed a bit rich and frequently gave him an upset tummy - tried this on recommendation and never looked back. There is slightly more dust/crumbs in the bottom of the bag compared to JW but nothing like cheaper foods - just be careful when you tip the last bit out. Full of fish oil for coat and skin, glucosamine for joints, hypoallegenic, and a great price - what more could you want! This is an excellent food for the money - not too rich, so doesn't upset tummies & smells much better than meat based food. My dogs all look really well on this and no itchy skin! It's the first food which I have bought which all three of my Ridgebacks will eat day in day out.